Terengganu is a state by the seaside located at the east coast of Peninsular Malaysia. There are many beautiful white sandy beaches surrounding the coastline and hence making it a popular travel destination among the locals and visitors from overseas as well. In terms of food, Terengganu food often shows the influence of Thai culture and taste due to its geographical location and history background. Visitors get to choose from a variety of food that are delicious and yet very much affordable. Keropok Losong is a type of finger food specially made in Terengganu. The delicacy is made from fish meat grounded with sago and salt, then rolled into a long tube shape like sausages and then boiled or fried. It is best eaten when dipped in chili sauce provided by the stall. The keropok can be found at most of the places in Terengganu but the famous one is at Kampung Losong. Another signature dish from Terengganu is Nasi Dagang. It is basically a mix of rice with glutinous rice and then added with coconut cream once cooked. The rice is always served with sidelines of fish curry, hard-boiled eggs and some vegetable pickles. Visitors can savor the dish at Kampung Ladang located with the Kuala Terengganu district. Ketupat Sotong, are made from glutinous rice which soaked in coconut milk and then stuffed into the squids. It is a popular dish enjoyed by the locals here especially during tea time. This delicacy can be found in most of the food stalls here in Terengganu. Visitors must try it whenever you come across it. Prepared with wheat and rice flours, Laksam is a delightful dish not to be missed when you visit Terengganu. It is eaten with special gravy made from fish meat that is boiled, pureed and mixed with coconut milk hence the wonderful fragrant smell and rich flavor. Lompat Tikam is a type of cold dessert made from rice flour and a mixture of coconut milk. 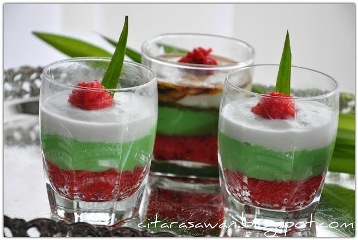 Coconut syrup is poured over the top of the jelly part when enjoying this dessert. It is a mouth-watering dessert best enjoyed during the hot weather. Akok Terengganu is another traditional sweet dessert found here. It is made from a mixture of rice flour, eggs, sugar and coconut milk and then heated it in a mould until solid. It can be served once cooled and taken out of the mould.